From 19 to 22 October, I attended a four-day training event on the conservation of parchment at the National Archives in Kew. Parchment can be a problematic material to work with as it highly sensitive to moisture. Since many of the treatments we use in paper conservation utilise water, we have to employ methods that use the smallest amount possible to avoid irreparable damage. 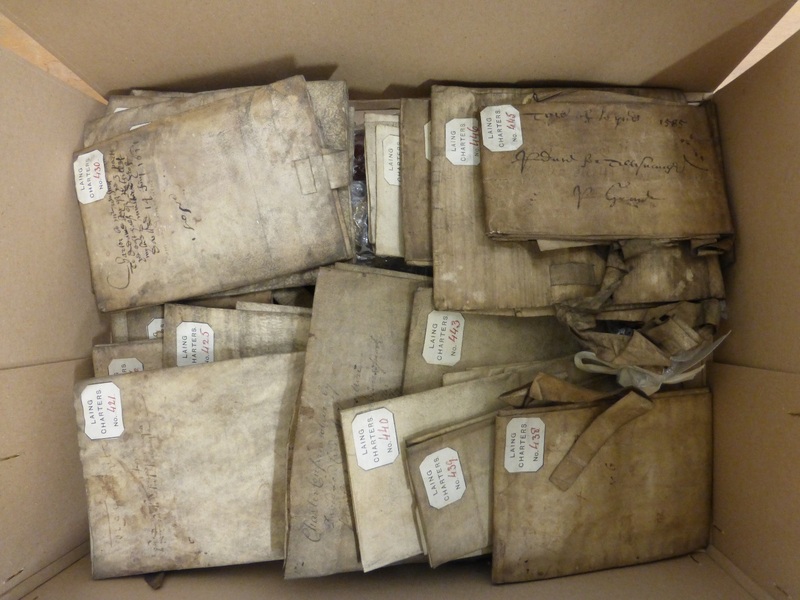 We have a large amount of parchment in our collections at the CRC, including approximately 3000 parchment charters in the Laing collection, so I was keen to find out more about this material and learn the very latest techniques for its conservation and preservation. The event consisted of two days of lectures, followed by a two-day practical session. The lectures were open to a large number of people, whereas the practical workshop was limited to a maximum of 15 attendees. The talks during the first two days focused on the making and analysis of parchment. The first talk was by Theresa Lupi, freelance Book and Paper Conservator in Malta, who discussed aspects of codicology and how it can be helpful to conservators. By studying different elements of the manuscript, we can learn how the parchment was made, what tools and techniques were used to prepare it and how this might affect its longevity and the treatments we can use. Following this, Theresa also gave lecture on fragments of manuscripts. Parchment documents were often recycled and reused in the past, and fragments can be found in the bindings of later books or used a wrappers for other items. These fragments can give clues to the how manuscripts were historically used. Next, Dr Fiona Brock, Lecturer in Applied Analytical Techniques at the Cranfield Forensic Institute presented a paper on the radiocarbon dating of parchment. Fiona first described the method of radiocarbon dating and discussed the advantages and disadvantages of using this method to estimated when the parchment was made. After this, Professor Matthew Collins from the University of York presented his research which focuses on the identification of skins in our archive, and how this can tell us about the history of livestock management and craft. Matthew uses small eraser slithers which are gently rubbed against the parchment to remove a minute amount of material from the parchment. These tiny samples are analysed and the type of animal used to make the document can be identified. This service is offered for free and you can obtain a sample kit by emailing matthew@palaeome.org. The day ended with a presentation by Jiří Vnouček, Conservator of Parchment and Paper at the Royal Library of Copenhagen. Jiří discussed the methods of parchment making and how it has changed over the centuries. Studying the production techniques can give conservators clues which help date and give provenance to the manuscript. The next day began with another talk from Jiří, which followed on from his presentation the previous afternoon. He first focused on the methods of parchment making in the UK, and showed the below video of the methodologies used in Britain in 1939. He also discussed parchment making in Iceland and how the preparation can affect the final result. The following talk by Angelica Bartoletti, Researcher in Conservation Science at the Tate, examined parchment on a nano-scale. Angelica states that not all damage to parchment is visible and by scrutinising the material on a micro-scale, we can detect damage before we can see it with the naked eye, and develop conservation techniques to reduce the effects of that damage. The penultimate talk of the day was by Dr. David Mills, Microtomography Facilities Manager at Queen Mary University of London. The main focus of this talk was on the Apocalypto Project, a collaborative effort between conservators, scientists and computer vision experts to investigate how x-rays can be used to reveal obscured writing or text on parchment. David and his team used a CT scanner to take a 3D x-ray of a tightly rolled piece of parchment. Using a computer programme, they were able to digitally unravel the scroll and decipher the handwriting, without causing any detectable damage to the document. This technique has also been successfully used to view previously inaccessible archives, including glass plate negatives which have been stuck together, and a roll of film that was severely degraded by vinegar syndrome, which can be viewed in the video below. Amazingly, this service is offered for free! Email David (D.mills@quml.ac.uk) for more information. The final talk of the day was by Edward Cheese, Conservator of Manuscripts and Printed Books at the Fitzwilliam Museum Cambridge. He gave a talk on the repair and binding of parchment manuscripts. Edward evaluated the balance between the risks of conservation treatment, against the benefits to collection items when they have been conserved. For example, Edward argued that although treatments such as humidification may have negative effects on the substrate, this is preferable to leaving the document unusable, or leaving the item in a state which encourages repeated stress on certain areas when handled. For example, a parchment charter that is difficult to open should be humidified and flattened, rather than repeatedly opened and closed which will eventually cause a split, even though the humidity may cause damage on a micro level. Overall, I found the first two days of the event informative and inspiring, and it provided a great base for the practical session that followed. 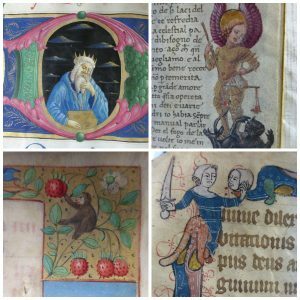 Read the second part of this blog to find out more about historic conservation of parchment, and up-to-date methods conservators use today – coming soon!